You must be a member of the Brussels Let's dance! Group to attend this activity. Would you like to join this group? We are pleased to invite you to a series of dance classes where you will be taught the basics of some of the following dance styles: Slow Waltz, Viennese Waltz, Quickstep, Slowfox, Tango, Polka, Swing, Charleston and Latin dances such as Cha-Cha, Rumba, Samba and Jive. These classes will help you get ready for the next Brussels and European Ball season*. 18: Protected content Registration formalities, please arrive early. 19: Protected content Combined dance class and practice session. And One: Heel Flat movement of the right foot as it goes forward In the line of dance: put the Heel down on the And count and Flat on the One count. Keep this step small. Turn 90 degrees CW facing the wall as you make this step. Two: Ball movement of the left foot as you move sideways in the line of dance, landing on the Ball of the left foot. Keep the heel of the left foot up, also during the next step. This should be the largest step in this dance. Shift your weight to the left. And-Three: Ball Flat movement of the right foot: with your weight on the left, move your right foot sideways in the line of dance and place it next to your left foot landing on the Ball on the And count, then Flat on the floor (heel down), on the Three count. Turn 45 degrees CW while doing this step. And-Four: Ball Flat movement of the left foot as you move your left leg back in the line of dance, landing on the Ball first on the And count, then Flat on the floor on the Four count. Keep this step small. Turn 90 degrees CW facing the Centre (your body should twist from the waist down) as you make this step. Five: Ball movement of your right foot sideways (parallel to the line of dance) landing on the Ball of the right foot. Keep the heel of the right foot up, also during the next step. This should be another large step in this dance. Shift your weight to the right. Six: Flat movement of your left foot: drag it on the floor towards your right foot, ending next to it. Turn 45 degrees CW while doing this step. The Flat movement is to ensure that you don’t rise during this movement. Remember, no rise and fall in the Viennese waltz. Hope the above makes sense, if not, don’t worry we’ll repeat it in class! This coming Sunday we will repeat what you've learned in the past week and practice , before starting with other dance styles that many of you want to learn in preparation for the upcoming balls. No previous experience is required, beginners are welcome. Come alone or with a partner, we will change partners during the class. Please note that the insurance cover that you get with the Euro Danse Club card does not apply at this venue. As with all InterNations activities, you participate on your own risk. *About the Brussels Ball season. 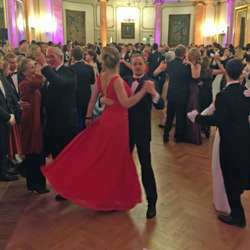 The Brussels Ball season stretches from October to June.